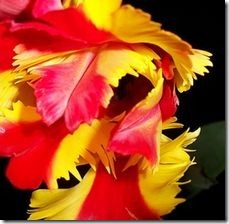 Parrot tulips, which resemble the namesake tropical birds, are a variation of the classic tulip. These flamboyant flowers, with their notable curled, twisted and wavy petals, stand out in any garden. 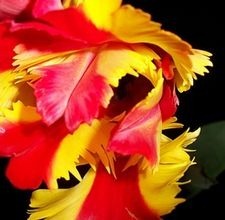 Parrot tulips come in a variety of bright colors, including white, pink, gold, yellow, orange, red and purple. The petals generally have fringed or serrated edges. Each stem hosts one large, cup-shaped flower bloom. As the flower bloom opens, it gets wider and wider until it is almost flat like a plate. Parrot tulips are sensitive to weather, and don’t fare well in cold, wet weather. The petals are easily damaged by rain and wind. The parrot tulip blooms in mid to late spring. The parrot tulip is usually about 12-28 inches tall, averaging about 16 inches, making it a great background or border pant. Some varieties of parrot tulip include the Apricot Parrot, Black Parrot, Blue Parrot, Estella Rynveldt, Fantasy, Flaming Parrot, Orange Favourite, Rococo, Texas Flame, Texas Gold and White Parrot.